Redesigned look and feel, adds full support for OS X Yosemite, and more. The Pixelmator Team today announces Pixelmator 3.3 Limestone, an outstanding update to its powerful, fast and full-featured image editor, featuring an all-new design, full feature and technology support for OS X Yosemite, and more. Pixelmator 3.3 Limestone is available today as a free update on the Mac App Store. Pixelmator 3.3 Limestone has been redesigned with an all-new look and feel inspired by OS X Yosemite. It keeps the black interface Pixelmator fans love, but enhances it with translucent elements to cohere with OS X Yosemite’s fresh and modern look, all while maintaining the power and speed users expect from Pixelmator. Pixelmator 3.3 Limestone adds complete OS X Yosemite feature and technology support and embraces new Continuity features, like Handoff, so you can switch instantly between Mac and iPad apps, as well as iCloud Drive support, so you can safely store and access all your images on the device you have at that time. Support for OS X Extensions offers an advanced-technology Repair Tool in apps like Mail or TextEdit. You can now easily remove objects and repair images right in the app you are using, without even having to open Pixelmator. Just add your picture to the message or document and use the extension tool to enhance it. Pixelmator 3.3 Limestone works wonderfully together with Pixelmator for iPad and features an enhanced Pixelmator file format for completely seamless editing experience. In addition, full support for Continuity features like Handoff and iCloud Drive makes it a breeze to edit and create incredible pictures on your Mac and on your iPad. Pixelmator 3.3 also includes a number of improvements and fixes related to stability and reliability. Love the updates, keep up the great work. Also would love if you could dock the pallets when you are in full screen mode, Depending on what type of graphic you are working on the pallets seem to just get in the way of everything. I’ll take that as a huge middle finger to the many, many users who have been criticizing the lack of an optional light interface since the very beginning. Nice. Fantastic Update! 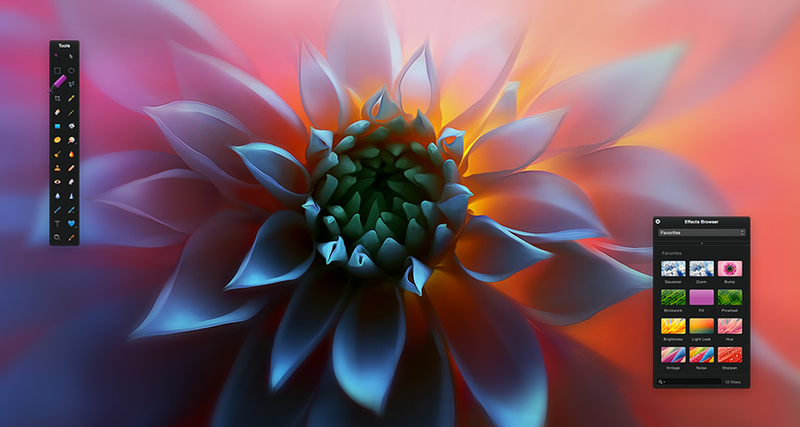 Oh, and where can I get that awesome wallpaper flower picture? This is also the sentence that caught my attention in this blog post. I can’t believe such a good piece of software gets completely ruined by its interface. Ouch. And Pixelmator has now 4:3 ratio in crop tool. Many thanx. But: I missing 3:2 ratio in crop tool. Can you build in, please? No single window option with docked toolbars – Bummer, No purchase! Cool. Hope the next update has non-destructive editing and the ability to export to PSD (without loosing shapes/vectors)!! I think the ones who want an all-new UI will have to wait for version 4. Developers usually do in-depth UI modification only with major new versions of their softwares. First, I would like to thank the Pixelmator team for continuing to update the Mac version and provide a very reasonably priced pixel editor with good basic functionality for OS X. Having quite a few years of experience with Photoshop, it is nice to have the layers, basic layer styles and the general tools available in the Pixelmator package. Note – I am not one to compare Pixelmator to the venerable Photoshop in an effort to express how I feel about the Adobe pricing. I just like that the basic features I am used to using for building some nice pixel-based files are present and working pretty solidly in Pixelmator. I am however; wondering about the screenshot from Apple’s site linked below appearing to show Pixelmator in full-screen with docked pallets and toolset (shown in the third section down on the leftmost iMac screen as viewed on a desktop monitor, but may not be fully visible on an iPad screen). The question I have is whether this is an intended future feature or simply a design concept used by Apple marketing? I agree with others that full-screen mode would be well served with docked pallets and tools (similar to what Aperture currently does in full-screen mode). Any insight from the Pixelmator team would be welcome. Either way, thanks again for the hard work. Looks like a solid Yosemite based upgrade. I’d really like to see the option for an application frame and tabs though. I’ve never liked floating windows in any application. Looks like a solid update, I would love love love non destructive editing to be added in. @CorkyO, that’s a future feature which will be shipped with the upcoming major upgrade. Another awesome update. Thank you! +1 for docked pallets and toolset. Do it like the new and awesome Affinity Designer (https://affinity.serif.com). They give you a choice for docked mode or separated mode and I love it! I believe many other users would love this to be in Pixelmator as well! Are there videos that show how extensions work? That sounds like one of the most interesting features in this update. Excellent news! Happy to continue supporting the effort for this and future versions. So many have expressed completely the opposite, both on these boards and elsewhere online. Moreover, the menu text at the top of a document (opacity, styles, reflection) are microscopic on my non-retina MBP 15 and nearly unreadable. This is compounded by the headache-inducing white text on black. I get it that white text on black is popular with many, but it is also very unpopular with many, as are the very small icons in the tool palette. Pixelmater is an outstanding product that shoots itself in the foot by alienating so many users with its less-than-friendly UI. Such a shame. @Dragon, we don’t intend to alienate anyone. We hear every opinion loud and clear. We just cannot offer everything that is being asked right this moment. However, we do consider feedback when planning for future updates. I think you should make it look more like photoshop. Get rid of all the icons and small white print. Go back to drop down menus. I am saying this in a nice way, because people are looking for a photoshop replacement. Pixelmator is a great program once you track down all the plugins. If you made it look more like photoshop you would have more users. dark GUI. that was the first thing I noticed about Pixelmator and loved it since day one. Back in the days PM was a very basic app, today is a PS-kind-of appthat really rocks! keep it up! Can’t wait for the new Photos.app to be released in 2015.. I have a feeling Pixelmator 4 will shine in conjunction with the photo extension library the new Apple Photo solution will provide. I’ve been a supporter since version 2 and the PM Team compels me to continue my support… To all the commenters wanting a lighter GUI, just give the dev team some time and I have a feeling PM 4.0 will include a switch to allow dark or light mode to suit every user’s preference. hi still like pixelmater but i really thought there would have been a change it looks much the same as before i do find the interface to contrasty (far too black grey would be better). i know you work hard but i am dissapointed. No docked pallets! What a shame. +1 for liking the dark user interface. I like it in Motion, i like it in Affinity Designer and i like it in Pixelmator. I don’t believe the people crying out about the dark interface are a vocal minority, but they may be much more vocal than many people who do like the dark interface. Great update guys! Don’t listen to the haters, the black interface is loved by many! I have always loved Pixelmator for its dark interface! I found it refreshing when I first came to it from an earlier version of Photoshop. And just to balance the complaining, I would like to issue a complaint that this new light interface is really hard to read on an iPhone. I miss the black blog. Can you guys link to the image you are using its great! Awesome updates! Yeah, nice update but not all fans “love” the black UI. I’d like to see it scaled down a notch to a more neutral gray option. That, and dockable windows, so I don’t have to manage bloody overlapping panels all the time. Ugh, sorry. I’m not that impressed. I was hoping that the ‘secret UI updates’ were all about a one-window view. This windowed palette stuff is from the 90s…Seriously, Adobe stopped using this for a reason. It’s very messy to work with. I would LOVE to purchase 20 licenses for the company if this got fixed. I really want to like Pixelmator but the black/white interface gives me headaches, and I hate the fact you can’t easily see the edges of windows and palettes when they overlap. I really want to escape from having to use Photoshop and was desperately hoping this update to Pixelmator would offer a preference option to change the interface colours. I’m not against a dark interface style – in fact I love that Aperture uses greys and offers two different interface colour schemes depending on whether the app is used full-screen or not. I get that this is a personal choice and that many Pixelmator users love the black interface. However for those of us that can’t abide it (and I think there are many), can you at least tell us if there are any plans to offer a choice via preference settings in the future? Just a small glitch, but it buggers me. If you have a dark interface, which I like, and the toolboxes are dark as well, then why on Earth do you leave some toolboxes (e.g. font selection) the standard light Mac dialogue window? I guess because they are standard and you were happy to make away without having to customize them, but this so lame. If you claim your new GUI, then make it right! I also found the “It keeps the black interface Pixelmator fans love […]” text slightly obnoxious, I don’t think it was helpful from a marketing pointing of view. Also another vote for an option to lighten the interface, an application frame, and dockable palettes, it think that would really open up the market for new Pixelmator users who would like to work in a more refined (less glaring) and more professional environment. Great product so far, it just needs to go the next level – please! I love the update, keep up the great work! I’d love to download the image used in the 3.3 promos to use as my retina desktop! Any chance we could get it? Just updated and find that when I use the rectangular marquee tool in a copy/paste routine, I now cannot just click on the image for the dotted outline to disappear. Instead, I have to go to the edit drop-down menu and click on “deselect.” This is annoying, and takes time. Any way that earlier feature can be reinstated? @George Lewis: Cmd+D to Deselect. Subsecond. Thank you so much for keeping the dark interface and beautiful pop out icons in the tools pallets. If you do decide to design a light interface at least make it optional so people can switch between it and the current version. As other people have said I’d love to see a single window update with dockable palettes in the future. This is a great update for what it intends to be: an OS optimization. I just hope the next feature update can add non-destructive edits / adjustment layers. I’d think that with those things being derived from Core Image that wouldn’t be too hard, but I really don’t know. Regardless, it is the one thing holding the software back from being a true professional tool. Non-destructive workflow is simply a must. But that shouldn’t take away from what is truly a great update. The iPad compatibility is really nice. The new layout is ok. But theres a serious problem to identify when its using flat color or gradient on Style’s pallet, cause the new layout lets swatch color with a default gradient :P.
A fabulous piece of software, which is great value for money, but I cannot use it, because of the black background. Who told you that the UI was loved? Must have been your marketing department. Would still like to be able to convert/Save/Export in CMYK. 1. I can’t change interface color. This is ridiculous for today! Black interface – eyes killer! 2. We still can’t type on path of shapes or what ever path.. I love Pixelmator, but I do agree that the black background of the tool palettes makes them difficult to see. Allowing the color of the tool palettes to be customized, even in a small way (four colors? ), would help. I find Pixelmator much easier to use (for my purposes) than other more expensive image editors. Thanks for that! I wanted to buy the program, but it won’t run on my OS X 10.8.5. Can’t upgrade to OSX 10.9, because Apple will not allow me to donwload it any more. Won’t upgrade to Yosemite, because it’s still more buggy than any OS Microsoft has ever released. Is there any possibility of buying an older version that will run on my computer? @ Max, we sell and support only the latest Pixelmator version. Sorry. I love Pixelmator, but I also think that it should give people more ways to customize its interface… Like opt between docked and floating UIs, and color customization for the UI. Apart from that its a really amazing app! Wonderful app. I am moving to freelance work and Pixelmator is one of several apps that has enabled me to ditch Adobe’s Creative Cloud and their ridiculous annual rates. You’ve gotta hit us with that single-window mode though! Having to shift the working window around because toolbars are in front, then re-zoom-to-fit is a big deal. (But at least they collect into one when doing a 4-finger down swipe, unlike GIMP where you have to obnoxiously click each toolbar/window to bring them individually back in front of any other apps). I’d love to switch away from Photoshop full-time, however the lack of a single window mode in Pixelmator is a deal breaker. I end up spending nearly as much time fiddling with my UI as I do working. And that’s a shame, because otherwise this truly is a great app. Yes, +1 for the single window mode, and a brighter UI. Black is hard when you have dark images, you can’t tell where they end and the app background begins. Just for your information, I’ve stopped using Pixelmator because of its black interface and small text, and no way to change it. It’s impossible for me to work with. I use Acorn now. “…the black interface Pixelmator fans love…”. I won’t say it, but you can imagine what I think of those words.